The crisp white dial of this alarm clock features a colorful firefighter's Maltese Cross in the center, black Arabic numerals black hands with luminous inserts, plus a silver seconds hand— all beneath a glass crystal. 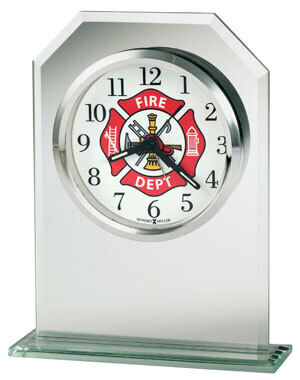 The dial is suspended within beveled glass mounted on a beveled glass base, and is surrounded by a polished silver-tone bezel. You will save $13.50 (30 %) on this Howard Miller Valiant 645-778.